We are proud to be among the first companies in this part of Europe that have measured its product's carbon footprint. The project had two goals. One of them was to analyse (and use) any potentials to lower our greenhouse gas (GHG) emissions and other negative effects on the environment related to them as well as costs. The other goal was to compare emissions resulting from drinking tap water from Flaska with emissions caused by buying bottled water. The carbon footprint project has been carried out by the company Ekogenca according to PAS 2050 standards. PAS 2050 demands the LCA or life cycle approach which means relevant emissions from every step in manufacturing, use and the disposal phase, have to be included. The carbon footprint was calculated for the Flaska Neo (neoprene sleeve) and the Flaska classic (cotton sleeve), also comparing different possibilities of shipping (home, shop). A four year period was chosen as the time frame, since we guarantee a 100% functioning of Flaska for this long. We have upgraded the basic footprint calculations with the future cutting emissions scenario, and the goals based on it. 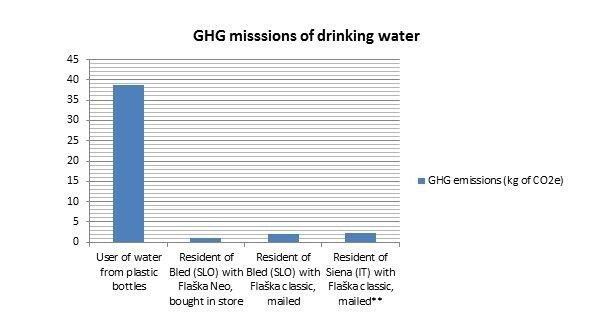 A comparison of GHG emissions of Flaska vs. bottled water was also conducted. Flaska Neo, bought in a shop, turned out to be the most efficient Flaska, considering the GHG emissions. The analysis also showed that an average resident of Slovenia (average usage of bottled water in Slovenia is 56l/person in a year) who gave up buying bottled water and started to drink tap water from Flaska, would lower his emissions of drinking water by at least 36.81kg CO2e or 95% in four years. The potential of lowering GHG emissions were also defined. The results were somewhat surprising because a relatively large share of the emissions is caused by local transport between different subcontractors. *Official data for bottled water in Slovenia (224l per person in four years) and Italy (756l per person in four years) have been used. **Delivery data for Slovenia is used. The difference for shipping to Siena would be insignificant.